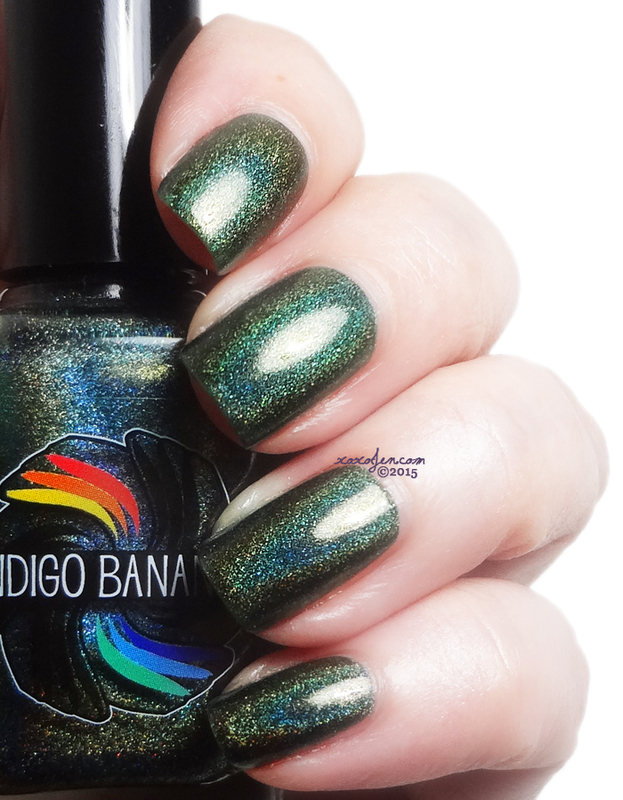 What drew me to the Indigo Bananas brand was a pink holo called Polish of Unusual Quality. It's a super vibrant pink with super holo rainbow that flashes purple. Its name definitely suits it. After I wore it, down the rabbit hole I went! Andrea must be a wizard, there's magic in those bottles, and this next polish is just as beautifully done. Olive Time and Space a dark shade of an olive-y green but more like a fir tree green than an army drab. I wore two easy coats and topcoat for the photos. The polish is fairly glossy on it's own and could go without topcoat in a pinch. Do you like this shade of green? I think it's a great fall and Christmas shade. Indigo Bananas launched a new collection today and is also having a great sale - here are the deets! Use code PAINTITBLACK for 25% off, INCLUDING the new releases - also stacks with free shipping after coupon applies. Sale ends 11pm Central Sunday night.